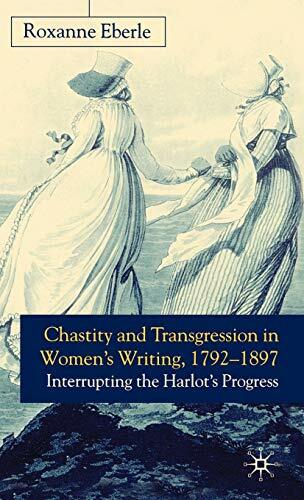 Chastity And Transgression In Womens Writing, 1792-1897: Interrupting The Harlots Progress: 9780333964958 Hardcover - LIMEROCK BOOKS INC. Working at the intersections of feminist literary criticism, new historicism, and narratology, Chastity and Transgression in Women's Writing revises current understandings of nineteenth-century representations of prostitution, female sexuality and the 'rights of woman' debate. Eberle's project explores the connections and disjunctures between women writing during the Romantic period and those working throughout the Victorian era. She considers a wide range of authors including Mary Wollstonecraft, Amelia Opie, Mary Hays, Elizabeth Gaskell, and Sarah Grand. ROXANNE EBERLE is Assistant Professor of English at the University of Georgia.